Comoros, which is officially acclaimed as the Union of the Comoros, is an archipelago comprised of volcanic islands bordered by Seychelles, Mozambique, Tanzania and Madagascar. This country on the eastern coast of the African continent is divided into three major islands namely Grande Comore (Ngazidja), Mohéli (Mwali) and Anjouan (Nzwani). Although Comoros claims three main islands, Mahore or Mayotte is said to be one of the major islands in the country, which will make it the fourth major island. It should be noted that each island has their definition of paradise and attractiveness. Mahore Island or Maore or Mayotte, which is considered as the oldest island among the four major islands in Comoros, is being governed by France although geographically situated in the Comoro Islands. This destination is known for its fascinating coral reefs that surrounds the island. Mahore or oftentimes called as Mayotte has a perfect blend of mountainous and aquatic attractions, which makes one of the most visited islands in Comoros. Grand Comore, which is the largest island among the major islands in Comoros, is where Karthala Volcano is situated. This destination is surrounded by several tourist attractions both inland and offshore. Grand Comore is the most developed and is said to be the economic and political center of Comoros, where the country’s capital is located. Mosquee du Vendredi, which can be found in Comoros’ capital city Moroni, is often called as the old Friday Mosque and is one of the most historical and attractive mosques in the country. This destination showcases architecture at its finest, displaying the ingeniously artistic minds of Comoros' locals. Mosquee du Vendredi can only be entered by male, which should strictly dress accordingly, wearing long trousers and should wash their feet before going inside the mosque. Mount Karthala, which is said to be the highest peak in Comoros and one of the most dangerous volcanoes on Earth, is rising more than 2300 meters above sea level. Situated in the largest island in Comoros, this destination is an ideal spot for hiking as tourists are interested in seeing Karthala’s huge crater. After several deadly eruptions, the volcano’s crater and surrounding have changed. Mohéli or locally called as Mwali, which is the smallest island compared to the other major islands in Comoros, offers amazing aquatic activities and scenery. This destination offers alluring beaches and interesting marine life like turtles nesting along its coastlines. Mohéli is a relaxing place to visit in this eastern African country and it also hold grand celebrations like the ‘grand marriage’ festivity. Considered as the second highest peak across Comoros, Ntingui Mountain is found in Anjouan Island standing over 4300 feet in the town of Lingoni. This is one of the most visited tourist destinations in the country because of its not so often seen view of the major islands around the archipelago. Ntingui Mountain, or simply Mt Ntingui, may be recommended to be climbed and hiked by advance to experienced climbers because of its steep and difficult trails. Chomoni Beach, which is one of the best beaches that can only be found in Grand Comore in Comoros, offers pristine shoreline and a relaxing ambiance to its visitors. This destination is one of the most bragged about spots in Comoros along with the Galawa and Bouni beaches. Chomoni Beach’s crystal clear waters hugging its white sandy shoreline and hitting the black volcanic rocks adds more dramatic feel to its natural beauty. Anjouan Island, which is a deserted island locally called as the Nzwani or Johanna during the old days, is one of Comoros’ treasures. Oftentimes tagged as the ‘Pearl of the Comoros’ and is being dragged to Robinson Crusoe’s characteristics, this destination offers authentic and relaxing Comorian culture. Anjouan Island also showcases the colonial architecture called Swahili-Shirazi architectural style that was used during the 17th centuries. Lac Sale or Lake Salt, which is one of the most notable attractions in Comoros, is situated in Grand Comore facing the Indian Ocean. This destination is a volcanic salt lake that is said to be ‘bottomless’ as no one has measured the official depth of this amazing salt lake. Lac Sale is surrounded by luscious greenery and it can be explored by travelers via walking around the lake. 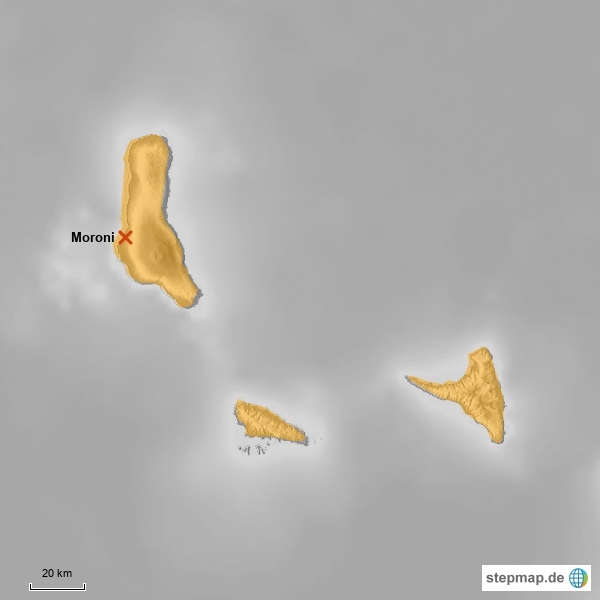 Moroni is the largest city found in the largest island in Comoros. Moroni, which means ‘in the heart of the fire,’ is the country’s center of politics. This destination is like a typical African capital city where nothing spectacular is being offered, but historical structures like mosques and government buildings are among the few sights in this city. Moroni is famous for the old Friday mosque called the Mosquee du Vendredi.